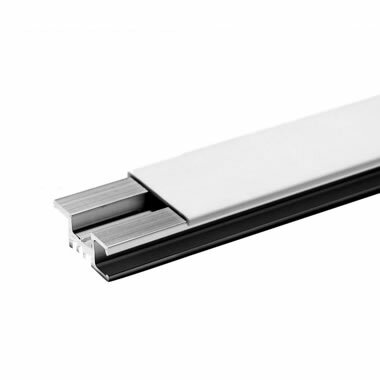 The CRE rail is an extruded aluminum rail with a clear finish. The rail is predrilled every 8″ for ease of installation, but can be drilled to fit your framing studs. Included in the CRE package is an off-white cover (which can be painted to match your decor), screws for mounting into wood framing, an alignment pin for connecting adjoining rails, and end caps for a neat finish The CRE rail comes in lengths of 2′ (CRE600), 3′ (CRE900) and 6′ (CRE 1800). The rails mount easily on walls, and can be joined for seamless coverage for longer spans. Arakawa clips attach to the rail at any location and can be moved horizontally along the rails.